Mary Holliday wrote from Meadville, Pennsylvania to her husband, Cyrus K. Holliday, founder of Topeka, Kansas Territory, who was presently touring Pennsylvania to speak in support of Republican presidential nominee John C. Fremont. Mary mentioned Mr. Howe, L. Lord, and Alfred Huidekoper, all friends of Cyrus. William D. Paul, who lived in Shawnee County, Kansas Territory had written. 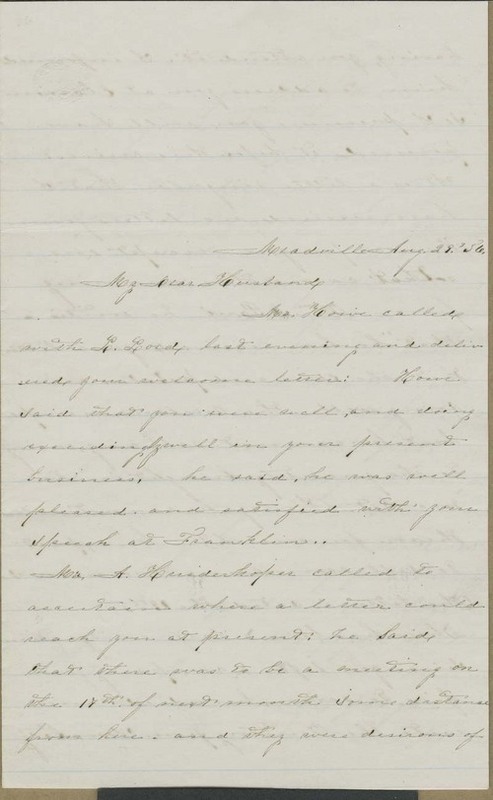 Quoting from his letter, Mary reported a skirmish between free state and proslavery men at Franklin, in Douglas County. Henry C. Titus, colonel of proslavery troops, and Israel B. Donalson, U. S. marshal, had been taken prisoner. Governor Wilson Shannon had negotiated a treaty. Mary also mentioned her ill health, and she hoped that Cyrus was well. People - Notable People - Titus, Henry C.